Officially licensed Gomez Addams adult costume from The Addams Family. The costume is perfect for creating the look of Gomez Addams and can be used by directors who are currently putting on The Addams Family musical. Costume is colored as pictured and includes jacket with inset shirt, bowtie, and pants. To complete the Gomez Addams look add a middle part wig and a pencil moustache. 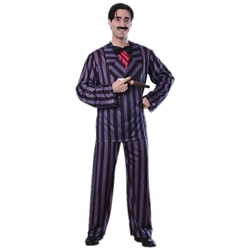 The Addams Family Gomez Addams adult costume is available in adult men's size standard or extra large.